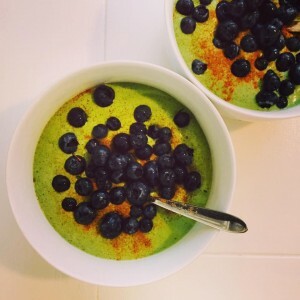 Let’s start Thursday morning with a healthy kick – another green smoothie for you all. This one is perfect especially if you’re having it after your exercise, in which case I would also recommend you to add a scoop of vegetarian protein powder to it (Pulsin, Sun Warrior, Purple Balance – just to mention a few options). Blend the almond milk and spinach first – then add all other ingredients and blend again until smooth. Dress with blueberries (or any of your favourite berries) and sprinkle over some cinnamon.